This summer was active and fun, but I found two events particularly encouraging this summer, in that they involved youngsters. In one case, an extremely motivated group of young fossil collectors, and in the second case, a surprisingly large number of youngsters on a night hunt for fluorescent material. At the Wayne County Club July 19th fossil dig along Canandaigua Lake we were joined by a new family. They were not new to fossil collecting, but until Sue Hoch happened to meet them, they did not know of our club. Turns out that 14 year old twins, Ian and Devon Underwood, have been collecting for years and this summer they built a fossil museum In their garage in Canandaigua. 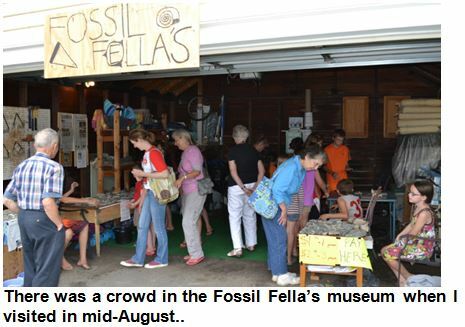 Together with two neighborhood friends they created a group called “Fossil Fellas” and opened their museum for the public. Both the Daily Messenger and the Rochester Democrat and Chronicle visited the site and wrote long articles about the group. I was greeted with the same guided tour as all other visitors. Each Fossil Fella provided useful and accurate information on a part of the collection. I learned about crinoids, trilobites, brachiopods, corals and more as the boys showed their well displayed and labeled specimens. The group was particularly proud of their growing trilobite collection including a nice Dipluera collected from the Jaycox member at Deep Run on the July 19th trip with us (see photo on page 1). Steve Underwood, Ian and Devon’s dad, has taken the group back to that location and to others and they have found several more trilobites and other Middle Devonian treasures. We look forward to sharing more fossil sites and hunting with the Fossil Fellas in the future. 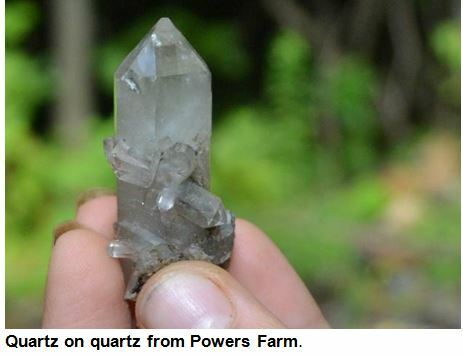 The second event occurred at the St. Lawrence Mineral Club show late last month in Madrid, NY. 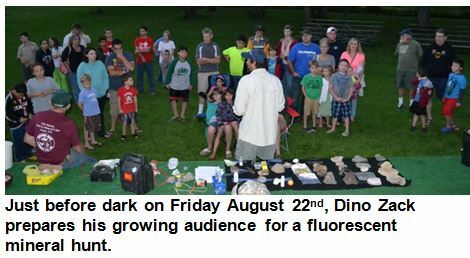 As darkness descended on Friday night August 22nd, Dino Zack entertained what can only be called a throng of eager youngsters. After a brief lesson in geology and minerals, each participant was provided a black light and a paper bag and sent out into the grassy field to collect. 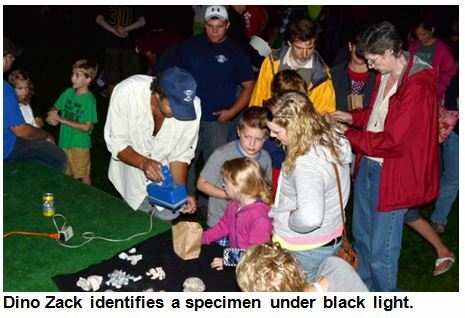 Dino later identified their finds, while the lights were passed to the next child. Before it was over more than 70 kids had participated! Each left with a few pieces of willemite from Franklin, some local fluorescents from St. Lawrence County, calcite from Canada, some chalcedony, etc. It was very rewarding to see so many youngsters enjoying an introduction to the wonderful world of rocks and minerals. The Madrid show also featured field trips each day. The Saturday trip to Powers Farm was attended by 31 collectors. About a third of them were youngsters and this nice terminated quartz was found by one of them, Trinity Baillargear. Sunday a smaller, but equally enthusiastic group of collectors converged on Bush farm looking for fluor-uvite. And that was not it. 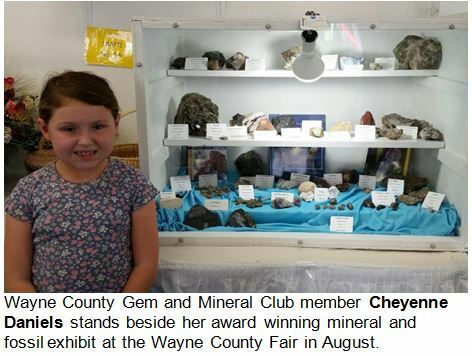 In August, WCGMC club member Cheyenne Daniels put her minerals on display at the Wayne County Fair.